Please vote there is a "moderate" chance of strong (EF2+) tornadoes overnight. This watch includes much of Louisiana and small parts of southern Arkansas and far western Mississippi. Make sure you have a way of receiving tornado warnings during the night. traditional "trick or treat" hours. 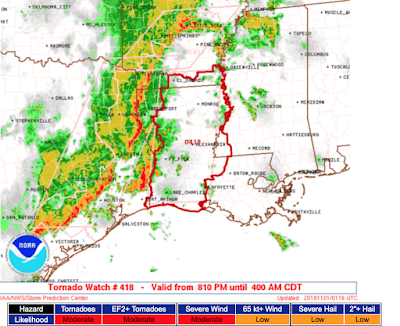 The watch includes Houston, Tyler, Shreveport and Texarkana. There is a "moderate" chance of tornadoes along with the threat of lightning, hail and damaging thunderstorm winds. Please factor this into your plans for the evening and have a way of receiving weather warnings. Ginger Zee on school bus flooding. Thanks for the shout-out, Ginger! 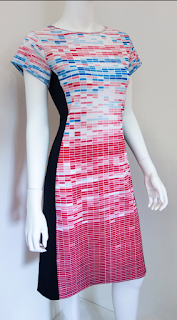 This just in from the fashionistas, we now have a "climate change dress." I guess it is to "raise awareness" of global warming. The colors are supposed to represent global temperatures. You can learn more here. Perhaps you can get it shipped in time to trick or treat as a "global warming monster." I highly recommend this blog posting from the Victory Girls. Poor advice pertaining to nutrition has caused obesity across the United States. The Los Angeles Times has a well-done article about the issues in nutrition. Unfortunately, the crisis of credibility in science is not limited to nutrition. We Had in the 1870's. Millions Will Die. A Carrington-Type Solar Storm or an EMP attack would destroy the electrical power grid. With our "just-in-time" inventories, etc., there would be no electricity, no water, no sewage treatment, and food would run out very quickly. In winter there would be no heat and no air conditioning in summer. Hurricane Maria, by itself, has caused major problems with medicine supplies. Society will quickly break down. Here is a summary of a recently declassified report. I have sent emails to my congressional delegation. I urge you to do the same. This issue must be addressed with the highest urgency. You can see more of B.C. here. The Aquifer is vital to farming in the Great Plains but it is being drawn down at an unsustainable rate. Here is an article about changing farming methods in a way that also allows farmers to prosper. The dashcam video is below. Note the bright yellow sign at right between the gate and the utility pole. It is a flood warning sign. Another school bus, with a student and driver on board, has been carried downstream in rapidly flowing floodwaters. 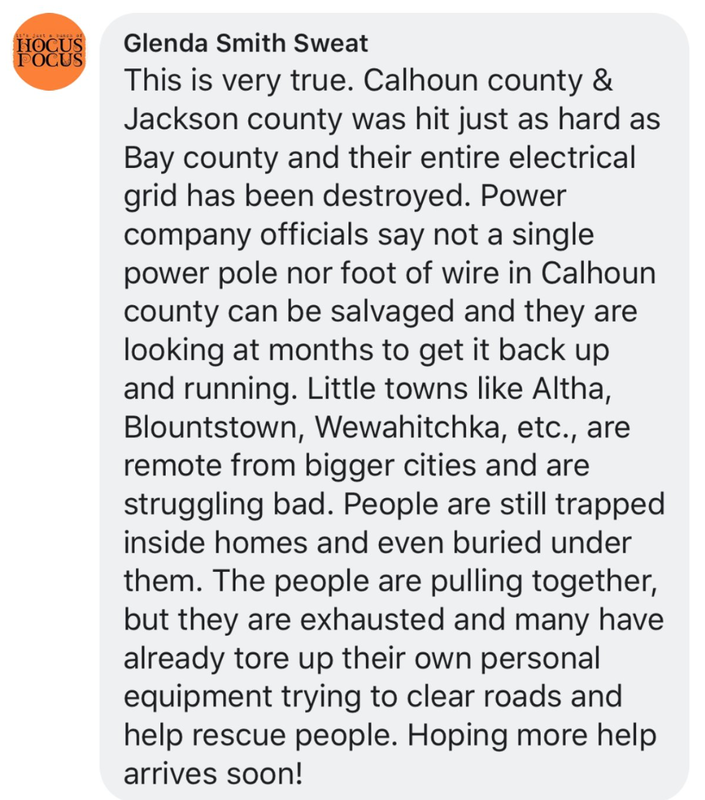 They had to be rescued. The driver was arrested. In this case, the dashcam video reveals the driver went around a warning sign (arrow). The original investigative report was posted the October 21st. I was unaware this had occurred. We are averaging more than one school bus flooding incident per week since Labor Day. It has to stop before someone is killed. Raytown (MO) school bus. "Kansas City Star" photo. In every case, the children and drivers had to be rescued. In some cases, they were called "close calls" with regard to injuries. There may also be cases unknown to the media where a bus narrowly made it out of flooding without becoming trapped. Just four years ago, we had an extremely serious situation near Wichita where the bus was overturned and carried downstream (below) by the swift current. 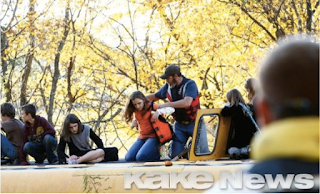 The 2014 case was a complicated rescue. Emergency management had to rig a system of ropes to get to the children and driver and get them safely off the bus. Still, there was one injury. The bus driver in this case was fired. If this continues, eventually someone is going to drown. The number of cases suggests they are not isolated occurrences. In fact, there were at least two examples the end of the 2017-18 school year, one in May and one in June. It is hard to understand why these are occurring. We know, in the United States, 76% of flood deaths are associated with automobiles. 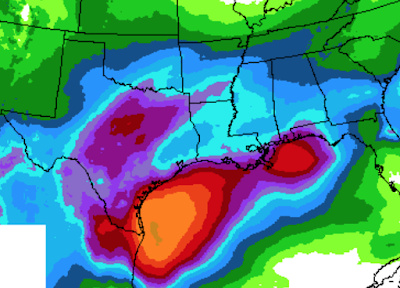 Thus, the "turn around, don't drown" campaign of the National Weather Service. It seems simplistic to think bus drivers are uniquely filtering out that message. 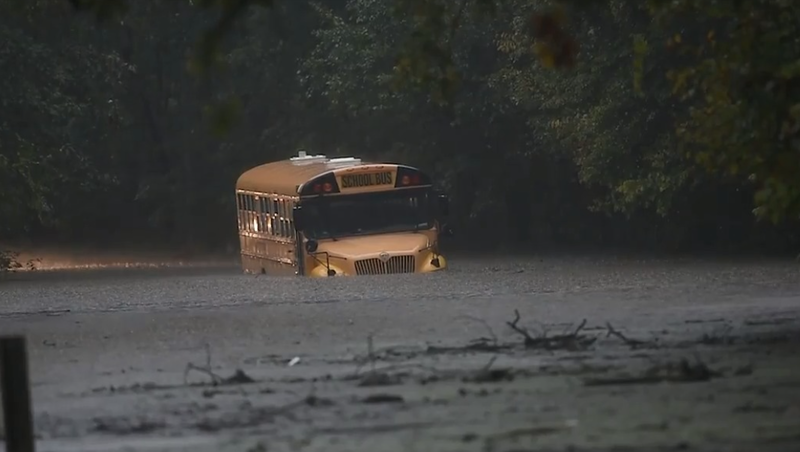 It is possible that because school buses ride higher than ordinary autos the drivers believe they can make it safely through floodwaters. There is the possibility bus drivers are put under sufficient pressure to make schedules that it causes them to toss good judgment aside and attempt to make it through flooding in spite of the fact the drivers involved in many of these instances have been fired. Regardless, this practice is so dangerous it must stop immediately. 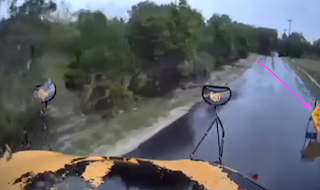 School districts and school bus companies must stress to drivers they should never enter floodwaters. Never. Ever. If there is some question, local authorities (fire or police) should be called before the bus proceeds or seeks an alternative route. Many school districts use commercial meteorologists. They can be consulted in flood situations. There may be other solutions beyond these. School bus drivers cannot continue to risk their lives and the lives of children in their charge. (c) 2018 Mike Smith Enterprises, LLC. All rights reserved. The earth-ocean-atmosphere system will never be in equilibrium. It has never been in equilibrium and it will not be in the future. There are too many internal and external forcings. For example, solar flares and volcanoes are two completely natural phenomena that drive changes. Humans add greenhouse gases and create land use changes (to name two) that destabilize the system. The idea (expressed twice today) that we will go into some sort of equilibrium if we reduce greenhouse gas is scientifically incorrect. 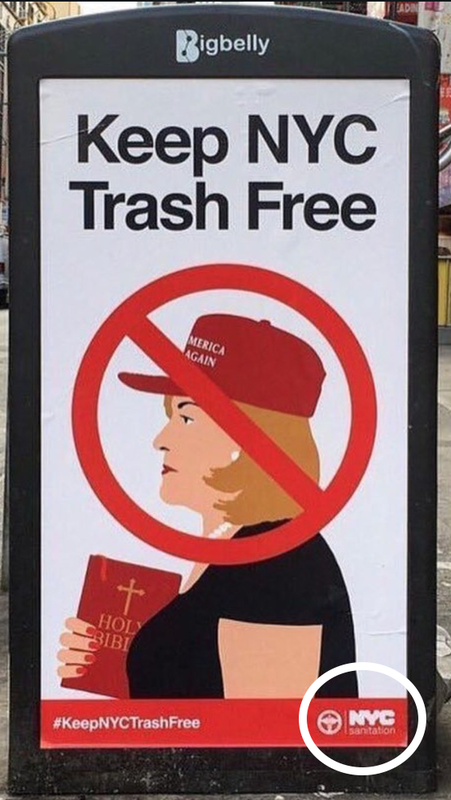 *They were put up by a street artist. Note: this is revised from the original posting as of 8pm Friday. 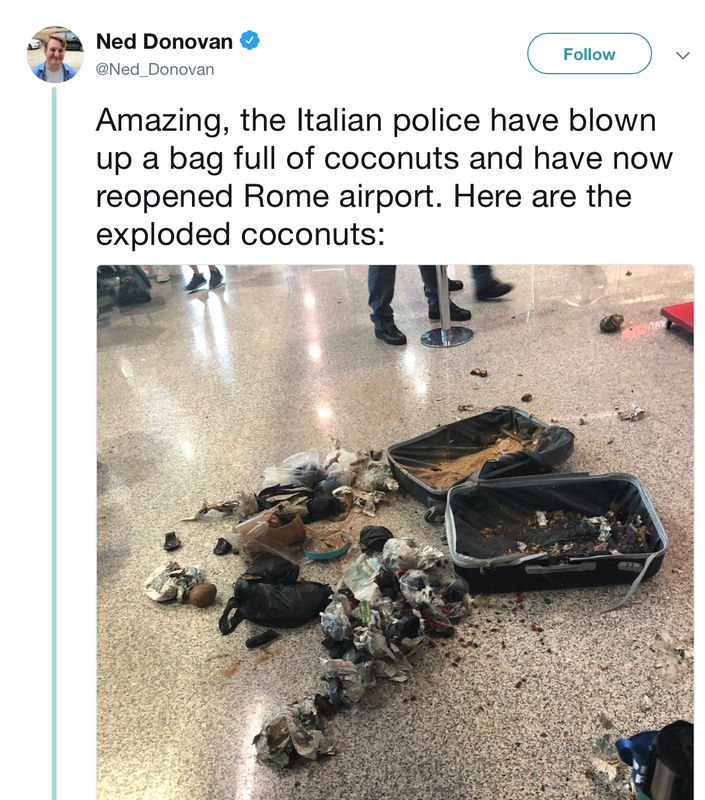 The Sanitation Department is now taking them down. Mayor de Blasio has not condemned them. I have travelled to NYC for business and pleasure and have always enjoyed myself. We took our children for Christmas 2001 after Mayor Giuliani requested people to "stay in a [NYC] hotel, go out to dinner and see a show" to help its economy after the horror of September 11. Apparently, the government of NYC has forgotten those acts of goodwill of ours and so many others'. See above. However, it speaks volumes that the mayor has not condemned them. That the number of major tornadoes is decreasing is a topic we've covered on numerous occasions. Here is a comprehensive article on the subject along with some rather surprising findings pertaining to temperatures in the United States. West Nile is a very serious disease, borne by mosquitos, as reported here. The article was published earlier today. You can get the latest forecasts for the risk of flu, mosquito-borne illnesses and others here: diseasecast.com . This time we have 12 years to prevent climate disaster. Two years ago, it was "100 days to save the world." We're still here. And, two years ago, the goal was limiting warming to 2° to save the world (the "two°" in the graphic). 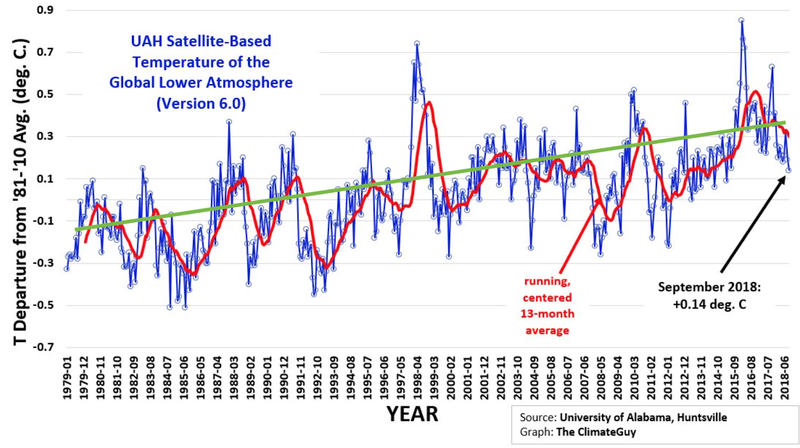 Now, it is a 1.5° goal because temperatures are not climbing nearly enough to exceed the two degree value and without lowering the goal they couldn't even claim there is a crisis. 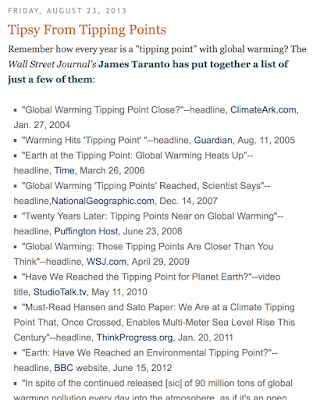 Every one of these (and more) represented some 'scientist(s)' proclaiming another "tipping point" that we didn't dare pass without destroying the earth. Of course, it is 5+ years later and we are here and doing fine. 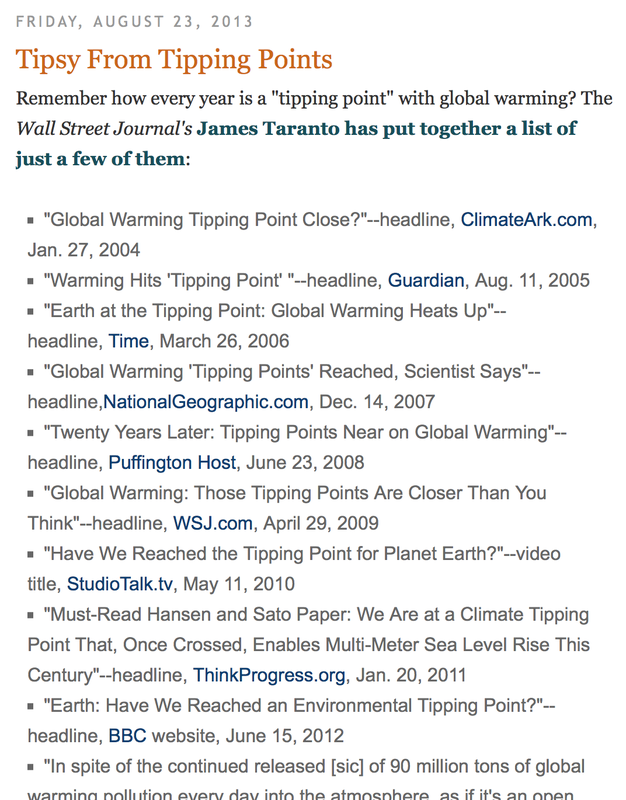 I suspect that one of the many institutes for global warming 'communications' (e.g., here) did a focus group a decade or so ago and found "tipping point" tested well. The problem is they have gone way past the point of diminishing returns -- no one believes these artificial deadlines any more -- with good reason. 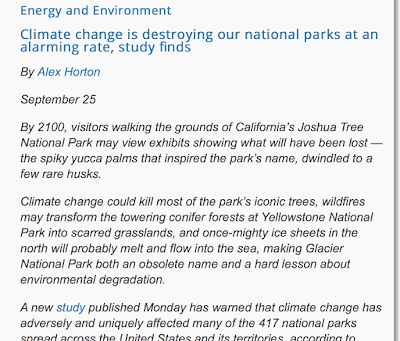 Even non-scientist Al Gore admits the IPCC's reports have been "torqued up" (exaggerated). 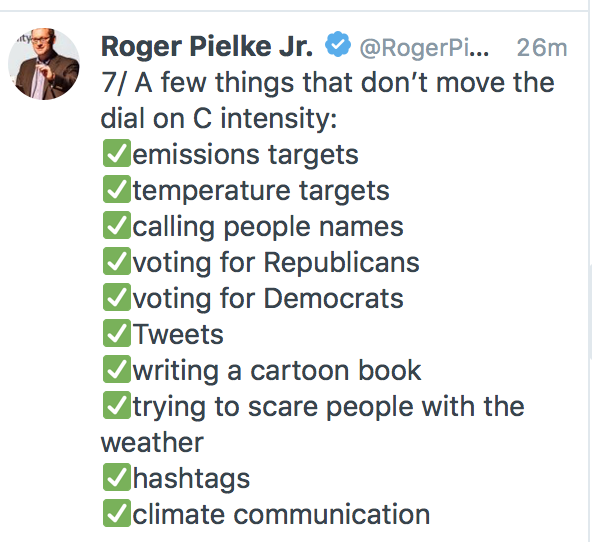 You will never see one of the global warming beat journalists admit any of this even though it would help their credibility to do so. They see their mission as convincing you the world needs saving rather than straight reporting. It would be refreshing to see this nonsense stop. If you want a great discussion that gets to the truth of both the science and politics of the global warming issue, go here. It is well worth the 37 minutes you will invest to view it. 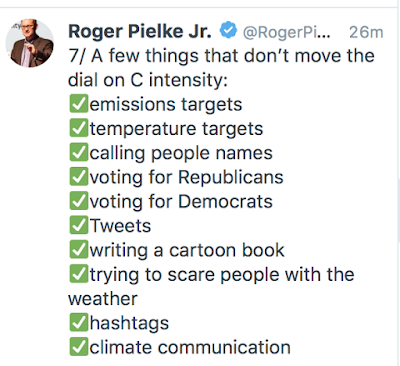 Otherwise, read the media's global warming coverage with a giant grain of salt. Here is the temperature trend as of September 30. At this rate, the world's temperatures will rise roughly 1°C/100 years. This is below the latest catastrophe goal of 1.5° and way below the 2° goal. This is an excellent article for non-scientists to understand how peer-review publishing works. I will add one other problem: the reviewers (the cake tasters) are members of the "club." Even though this is science, very few people outside of the political and scientific (yes, both) mainstream are asked to review articles. So, truly innovative concepts are more difficult to get published than they should be. It is 37 minutes in length (no commercials) and I strongly recommend it. 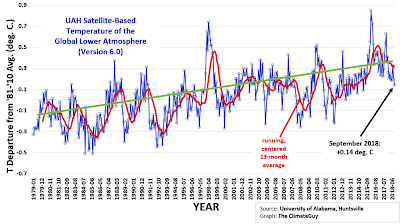 As this blog has reported on several occasions, the quality of data pertaining to global warming is, at best, poor. If you would like to read more on the latest audit of that data, go here. This outbreak is serious. 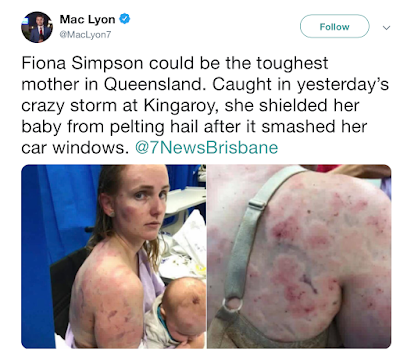 Please get your children vaccinated. 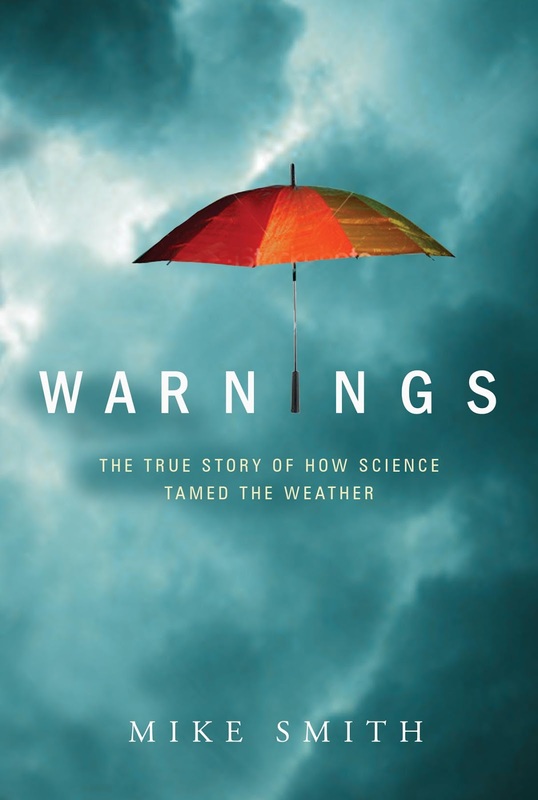 At least at 9:30pm CDT yesterday evening, Warnings was down to $15.00 at Amazon. So, pick up a copy. Get extras for Christmas gifts. I'm not sure when it will be this inexpensive again. 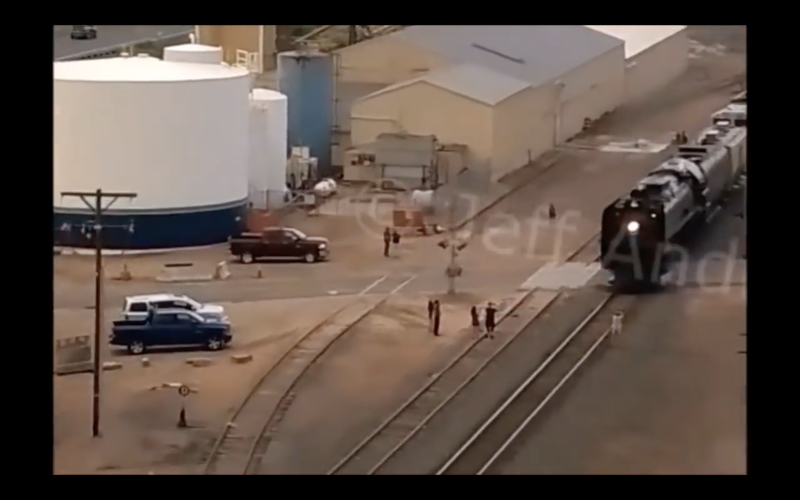 Too many people are getting killed along railroad tracks in America. likely have been killed. The noise of the first train could have prevented him from hearing a second train approaching. A woman was killed in June standing too close to the tracks in Colorado as a train approached. 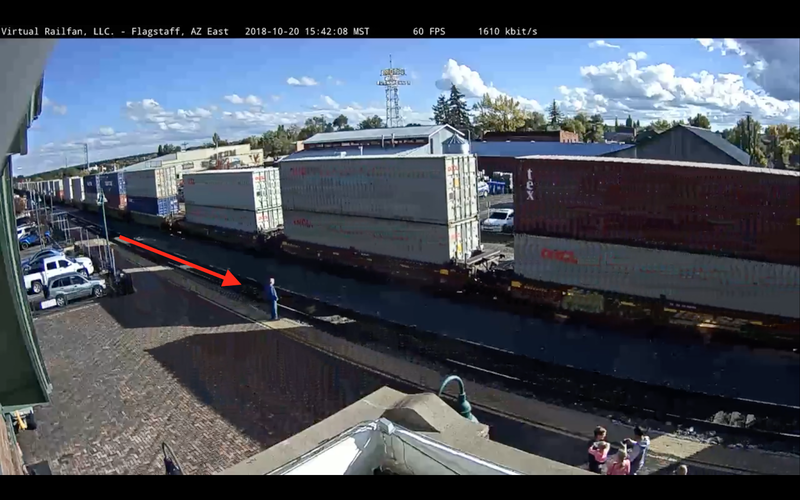 You can see her a second before her death in light colored-clothes on the right side of the tracks. Please stay away from tracks and teach your children to do the same! By definition: if it isn't reproducible, it is not "science." 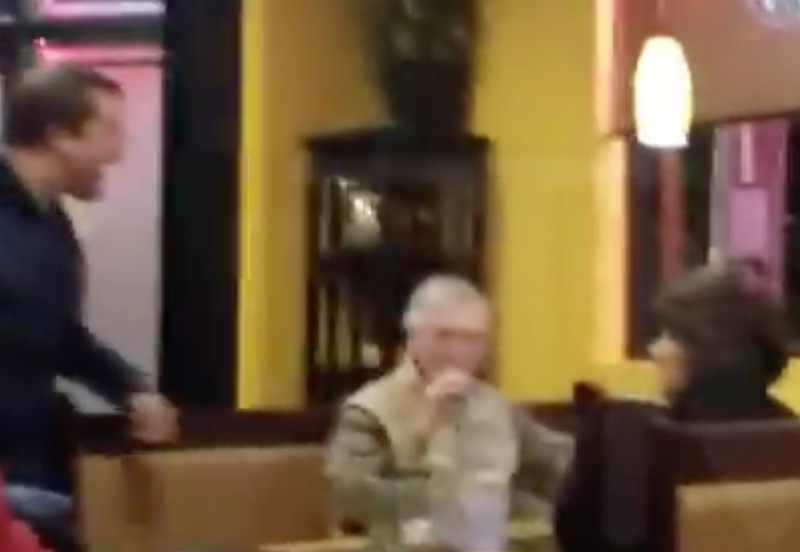 The mob has confronted another Republican politician in a restaurant. This time, it was Senator Mitch McConnell in Louisville. The woman shooting the video (which is here) says, "I'm going to sell it to TMZ." To me, that brings up the question: "Are some of these set-ups for monetary gain?" Where is Dave Barry when you need him? 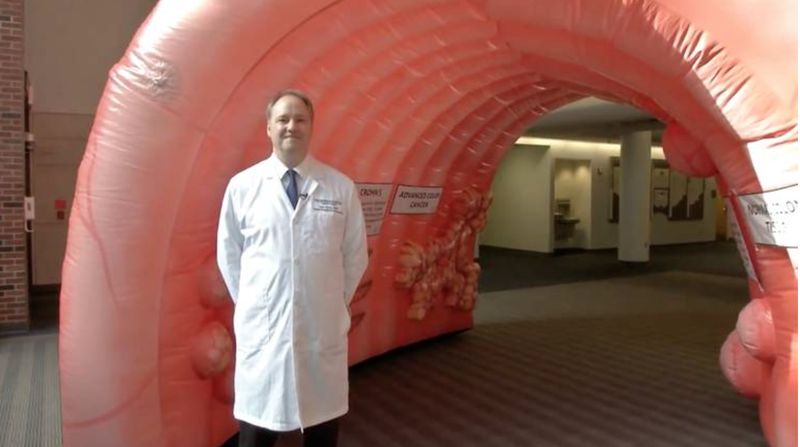 A giant colon has gone missing in Kansas City. When a giant colon came to Miami, this is how Dave began one of the most (tears running down your eyes due to laughing so hard) hilarious columns ever. If you are a professional humor writer, and there is a giant colon within a 200-mile radius, you are legally obligated to go see it. So I went to Miami Beach and crawled through the Colossal Colon. I wrote a column about it, making tasteless colon jokes. But I also urged everyone to get a colonoscopy. I even, when I emerged from the Colossal Colon, signed a pledge stating that I would get one. If you want to laugh, the rest of that column is here. 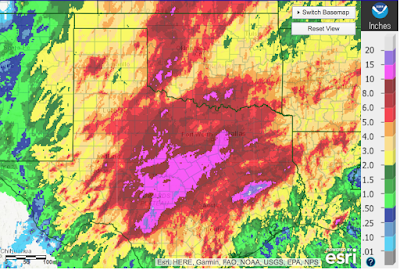 Here is the rainfall of the last two weeks. It has rained in Abilene the last eight days. 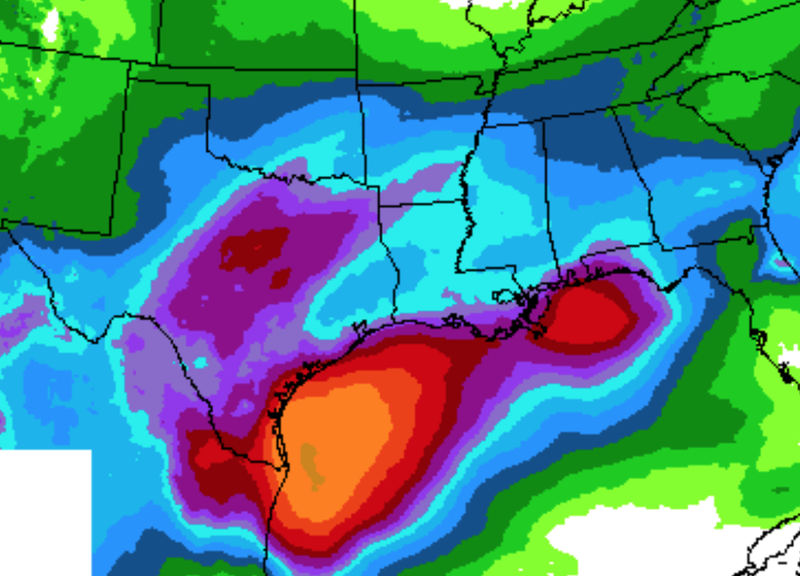 And, here is the forecast for the next seven days. 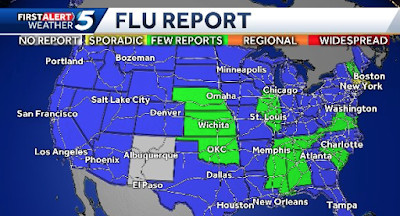 Thanks to KOCO TV for this easy-to-read map showing where influenza cases are occurring. We've already had two flu-related deaths in Kansas. Where is flu most likely to occur next? 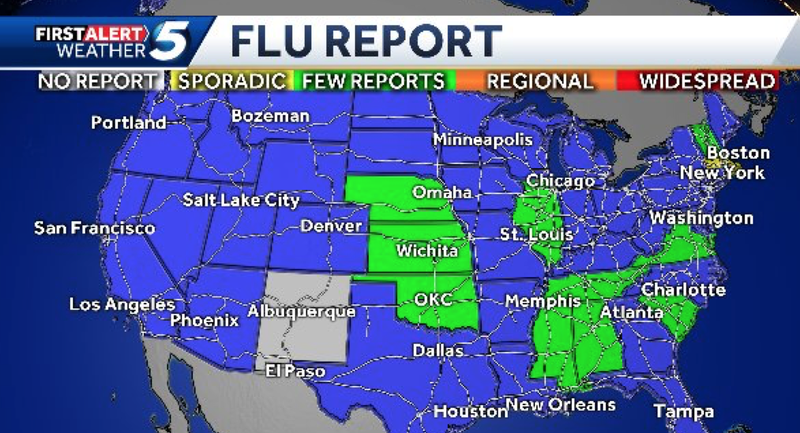 Here is the flu forecast map from Ascel Bio. Please get immunized especially if you are in the higher risk areas. 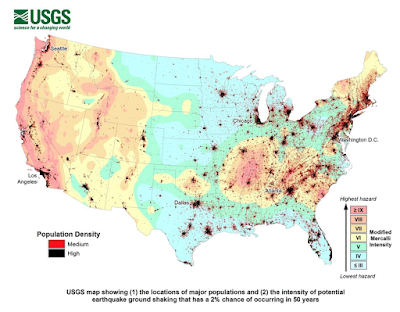 While my home in Wichita is in a very low risk for a major earthquake, it is important to realize that it isn't just the I-5 corridor of California that is at high risk. The I-95 corridor from Washington to Boston is at high risk as is the area from Atlanta to Charlotte. Heck, they can't keep their existing promises. Because tornadoes sometimes go undercounted, especially in the past and in less populous areas, scientists don't like to study trends by using counts of tornadoes. Back to Dr. Ted Fujita in the 1970's, there has been speculation about an east-west cycle regarding tornado maxima. It wish this study had referenced his work and commented on it. 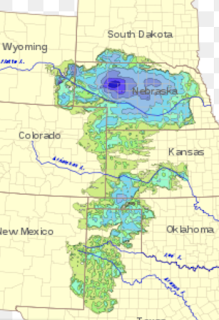 From 1979 to 1996 (release of Twister) tornado chasing was restricted to the Great Plains which might have had the effect of inflating tornado numbers versus the areas farther east where tornado chasing was much more rare. 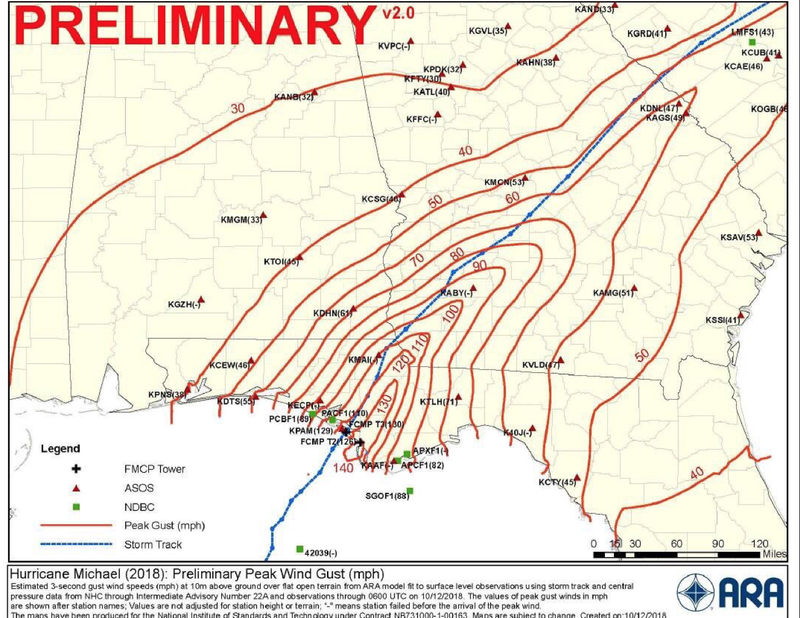 The STP (see below) is often not a good proxy for number of tornadoes. I have stricken out the incorrect information in the original posting. A reader brought to my attention and asked me to comment about this article pertaining to a study (based on a computer model) that alleges tornadoes are becoming less common in the Great Plains and more common farther east. 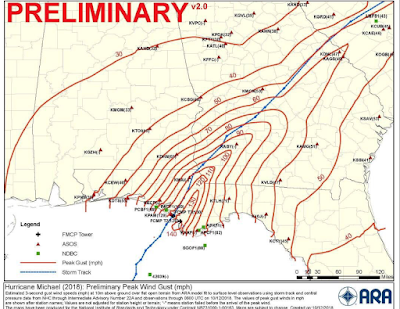 However, they didn't actually count tornadoes to see if their model was producing realistic results. "Because tornadoes sometimes go undercounted, especially in the past and in less populous areas, scientists don't like to study trends by using counts of tornadoes. 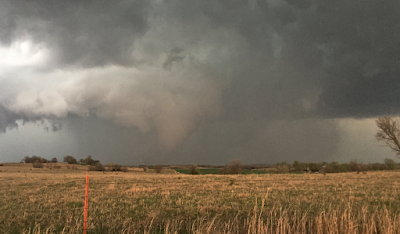 Gensini and tornado scientist Harold Brooks of the National Severe Storms Lab looked at "significant tornado parameters," a measurement of the key ingredients of tornado conditions." Unfortunately, the "significant tornado parameter" is not a good proxy for the total number of tornadoes. 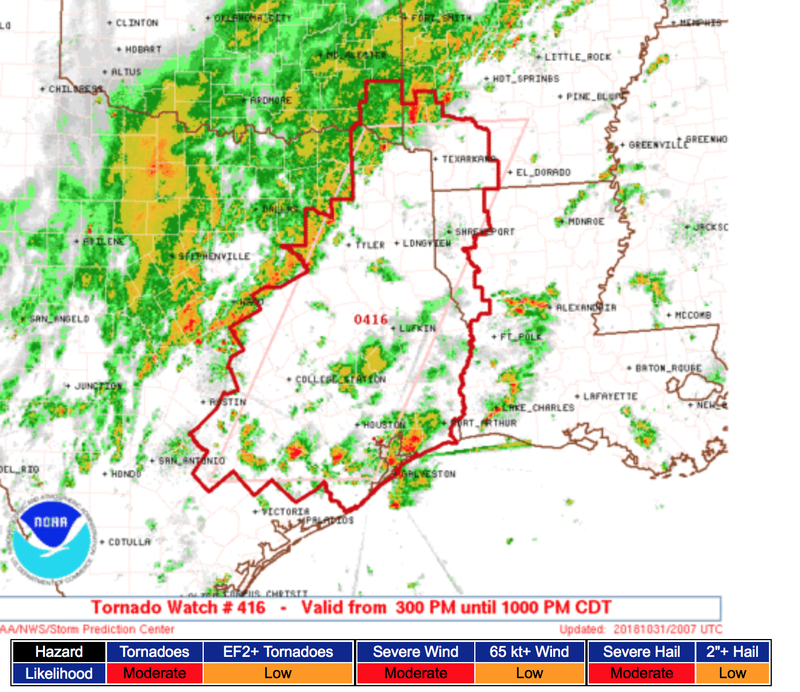 For example, on a given day the "STP" can be high but because the parent thunderstorms are elevated, no tornado occurs. There is also the fact that a study of less than forty years is too short in climatological terms to draw any real conclusions. 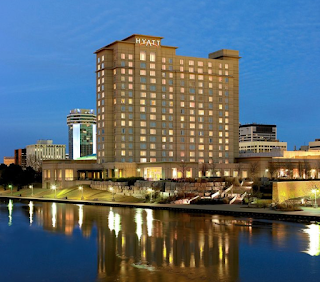 There is an amazing list of speakers for Chasercon 2019 to be held at the Hyatt Regency Wichita the weekend of February 8 -10. There will be special panel discussion, details soon to follow. Sunday morning, Jon Davies is doing a "forecasting for chasers" class that has received rave reviews in the past. And, the Keynote speaker for the Saturday dinner is yours truly. As previously mentioned, this is the #1 gathering of storm chasers, meteorologists and enthusiasts from across the country. It is held every year just before storm season begins. 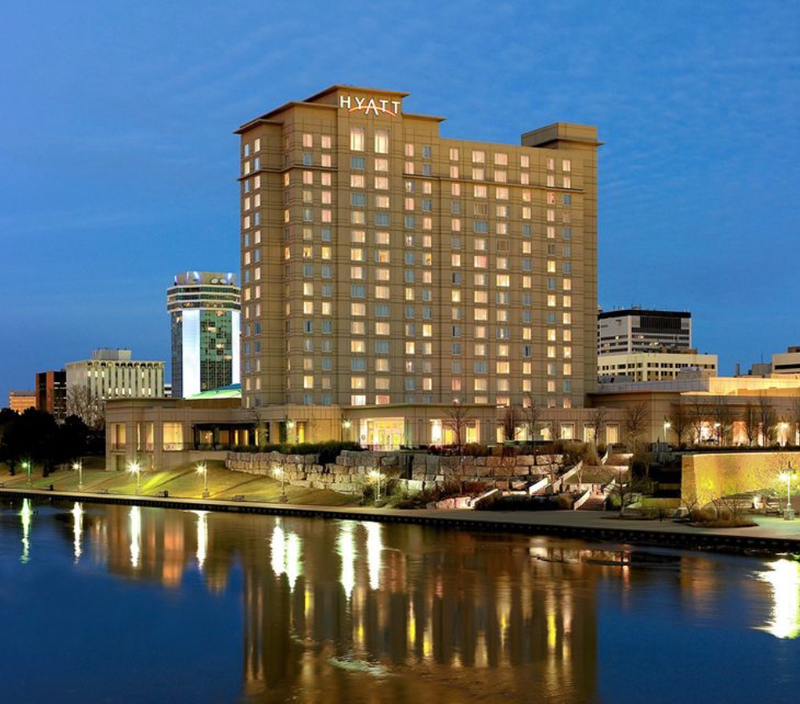 We had my retirement party at the Hyatt and the food, service and rooms were all outstanding. Below is the list of airlines that serve Wichita. 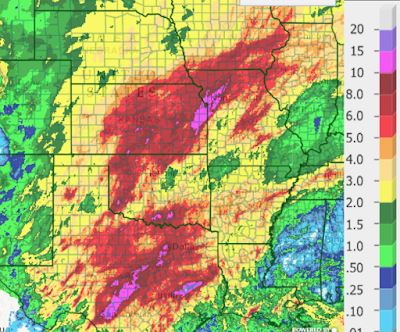 Here is a map of two-week rainfalls across the Great Plains. 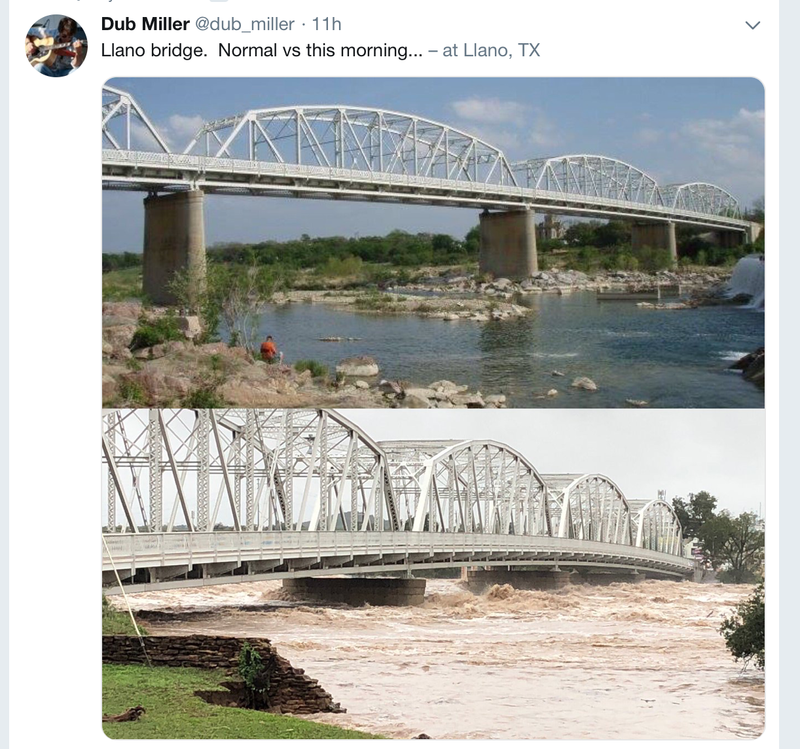 There is record flooding on the Llano River in central Texas. Dodge City has had the wettest October ever even though it is only the 16th. Please note that winds over 100 mph extended into southwest Georgia. 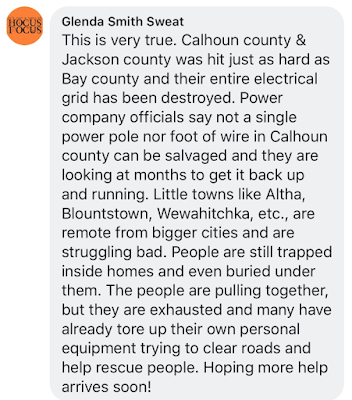 ADDITION: Some are reporting that the National Hurricane Center's peak winds, while plainly extremely destructive, may not have been as high as originally thought. Regardless of whether you believed Brett Kavanaugh should have been confirmed and whether you like Ted Cruz or not, the recent incivility is more than am embarrassment for our nation. Recall last year Republican congressmen were shot and Steve Scalise was nearly killed. Rand Paul was attacked and seriously injured in his front yard. It is fine to disagree about politics or anything else. 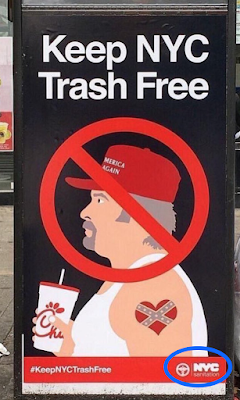 But, do it in a civil and respectful manner. We are all children of God which means we are worthy of love and respect. Let's stop worrying about color, heritage, etc., etc. Of course, some would stay, "this makes is really serious." 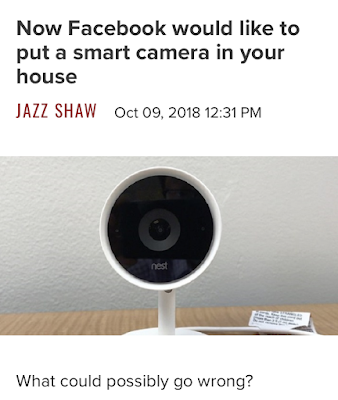 If interested, the article is here. Hurricanes are not getting worse. 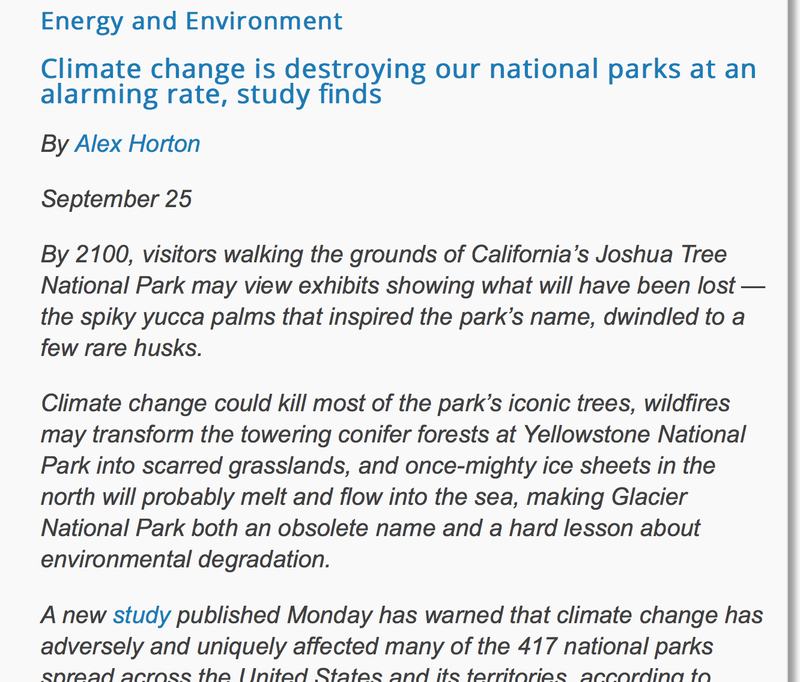 Here are the IPCC's exact words from its brand new report. Tropical cyclones meteorologists' jargon for tropical storms + hurricanes. We have illustrated that same point on this blog more times than I can count. 60 Minutes' claim hurricanes are getting worse = "fake news." 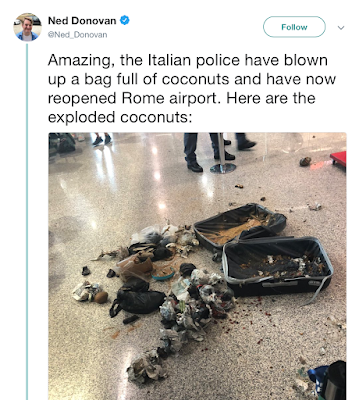 Airport security in Rome October 2 closed the airport because of ... coconuts. Geez. Reader review at Amazon. You can read that review and many more here. 1. Written like a great engaging novel, but it's all real! 2. Great science writing! Bravo! 4. The history of meteorology in elegant, page-turning prose from a first person account. 5. Meteorological terms well defined and illustrated. 6. The evolution of the Weather Bureau culture, fascinating stuff. 7. Mr. Smith knows his science and does a better job of conveying it to the masses. 8. Supercell thunderstorms, truly enlightening. 10. Interesting facts throughout the book. 11. How weather radars work. 12. The most important storm chase ever and why it is so. 13. Weather detective extraordinaire, Ted Fujita. 14. Find out when the first tornado was broadcast live. 16. The crash of Delta 191 in detail and its impact. 17. Doppler radars and its interesting history. 18. So many splendid examples of the progression of meteorology. Excellent! 20. The evolution of the creation of various weather agencies. 21. A fascinating look at hurricanes. A better understanding of wind forces. 22. Hurricane Katrina analyzed to complete satisfaction and what we hopefully learned from it. 23. The terrible tornado that struck Greensburg, Kansas. 24. The advantages of precise forecasting. 25. Great use of illustrations! 26. Enjoyable read from cover to cover! 1. No references to speak of. 2. Having to buy extra copies for friends and family. 3. Having to wait for Mr. Smith's next book! Before digital photography, it was generally believed to produce the best color reproduction of any kind of film. However, it was inconvenient because it required special processing that Ektachome and the others didn't. Finally, Kodak, its maker, stopped processing it. But, there was one Kodachrome processor left, in Parsons, Kansas. Bob Dotson, one of America's great storytellers, has details.